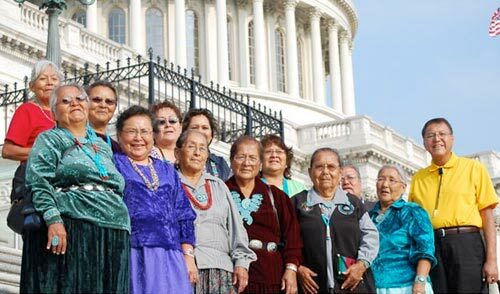 Above: Navajo grandmothers advocate cleanup on Capitol Hill. Photo credit: Clayton Childers. Navajo uranium activist Gillbert Badoni, Navajo Nation Council Member Phil Harrison and a delegation of Navajo grandmothers demonstrated at the Capitol today to demand compensation for families poisoned by cold-war uranium mining on Navajo Nation. “We screened our film, The Return of Navajo Boy for legislators, government staff and the public,” said Navajo grandmother Elsie May Cly Begay, “so they can understand the deep impact of uranium poisoning in our community.” For more on this action, visit the UMCGBCS website.